The evenings are drawing in, the leaves are changing and I’ve dug out my hot water bottle. Despite a couple of warm weeks, it’s definitely autumn. Although I LOVE summer and rather hate winter I secretly quite like snuggling up with a warm blanket to keep me cosy. 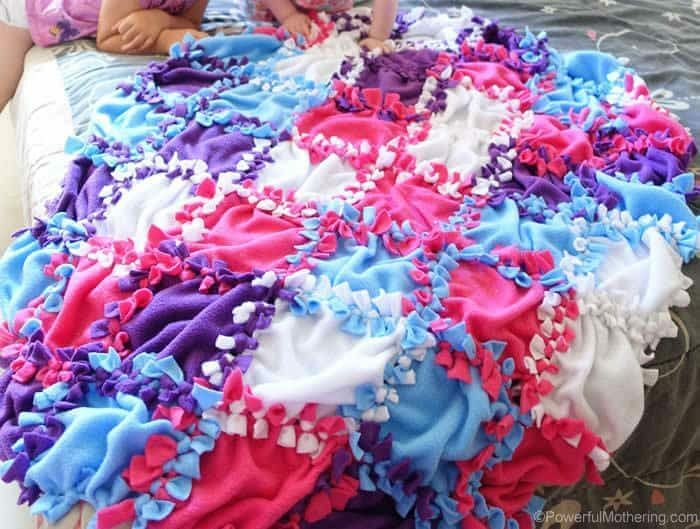 It’s so easy to make your own blanket I thought I would share with you some great recycled blankets – there’s no need to spend a fortune to be cosy! Sweaters are a great place to start. I love Claire’s recycled sweater blanket, particularly as she has edged it with waistbands from old jeans, what a great idea. Find the tutorial for the hexagon sweater blanket at Pillar Box Blue. How about a no sew fleece blanket? I’m sure with a bit of patience fleece comes in charity (thrift) shops. This looks great fun, and super easy to do. Find the No Sew Fleece Blanket Tutorial at Powerful Mothering. How about using up odds and ends of wool? 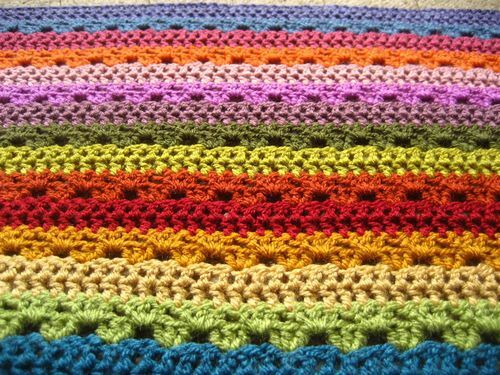 This stunning crochet blanket is easy to make, even for the novice! 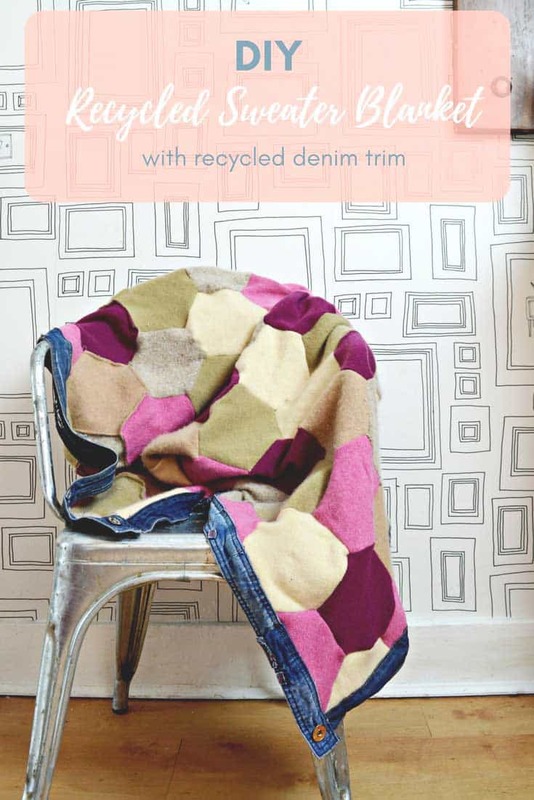 The vibrant colours, ease of making and the design which enables you to use up your scraps is a winner. Find the tutorial at attic24. 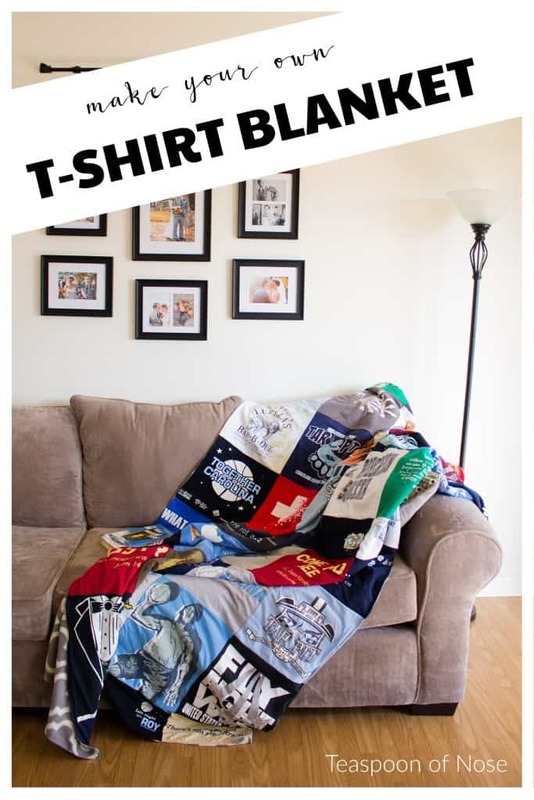 Do you have lots of old t-shirts lying around? This blanket from Teaspoon of Nose is perfect for keeping those memories. Emma shares a great tutorial including measurements if you would rather turn your blanket into a quilt for a bed. I have to admit although I am long past those days I can’t help but think how cute a blanket would be made from baby grows and cuteness. 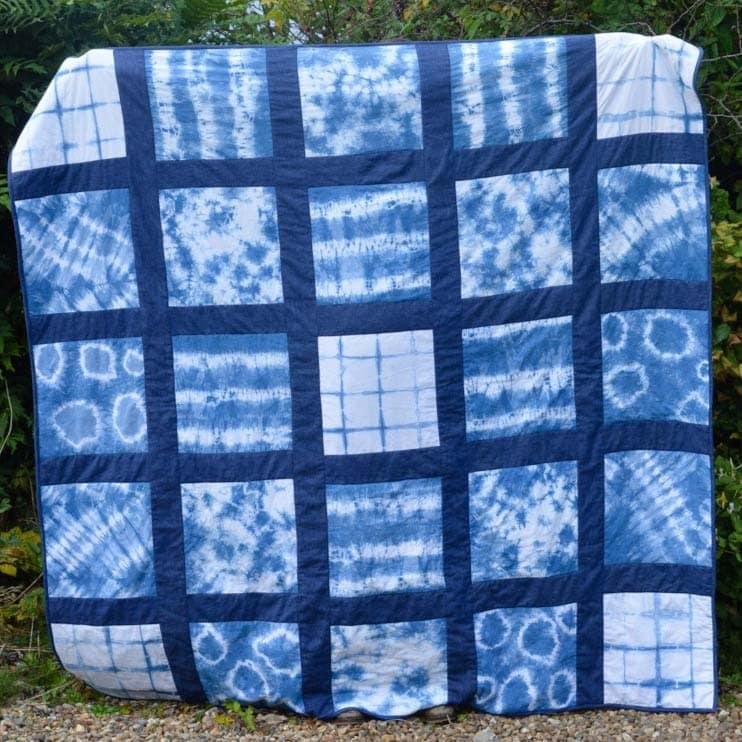 How about using old sheets or duvets covers and an Indigo Tie Dye kit to make an on trend Shibori blanket? Find my tutorial here. Still looking for inspiration? There are lots of creative ideas for blankets at All Free Sewing. 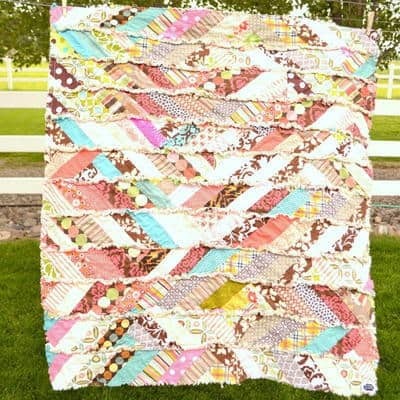 I love this scrappy fabric blanket – who doesn’t love a project for using up scraps? 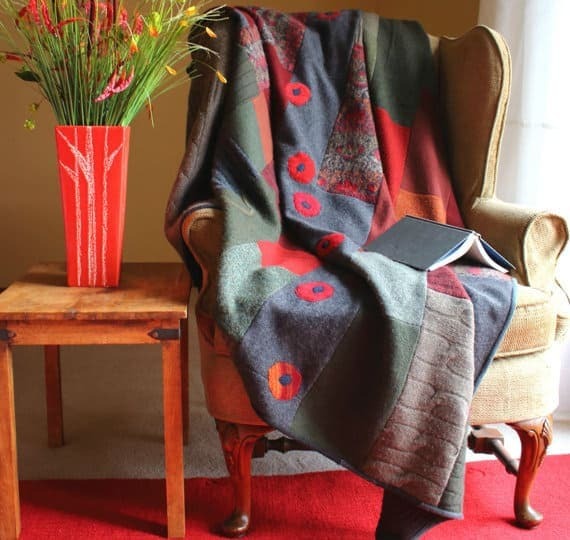 If you don’t fancy making one then I have stumbled across the most inspiring work at The Green Sheep Studio – absolutely gorgeous blankets made by Joan Olson. She works with former wool sweaters. I love the added details she uses on her blankets. Do you have some favourite autumn activities? I am determinedly trying to get outdoors, to capture any rays of sunshine, plus some fresh air. "How to make a Denim Floor Cushion"
"Great British Sewing Bee Live and learning from mistakes.."
Thank you for the shout-out, Vicky! I enjoy seeing the blankets you’ve posted–and I’m so happy blanket season has begun in earnest. You are so welcome, I love the added details you give to your blankets. Here’s to a cosy autumn. I love those blanket. I do some sewing works at home in my spare time. Blanket is such a huge project for me. It is a little bit difficulte for a beginner. But I want to learn more after reading your post. It is amazing.